I’m sick. I’ve been sick and more-or-less in bed for three days. Shout out to my husband for keeping everything running around here while I’ve been down for the count. 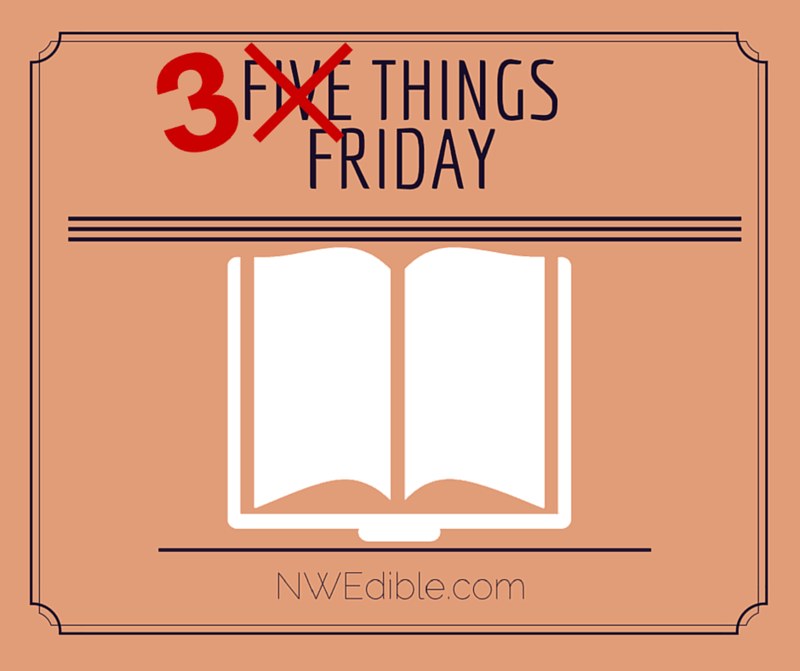 So this week’s 5 Things Friday is really 3 Things Friday. I’m cutting it off short so I can go crawl back into bed with my tea. 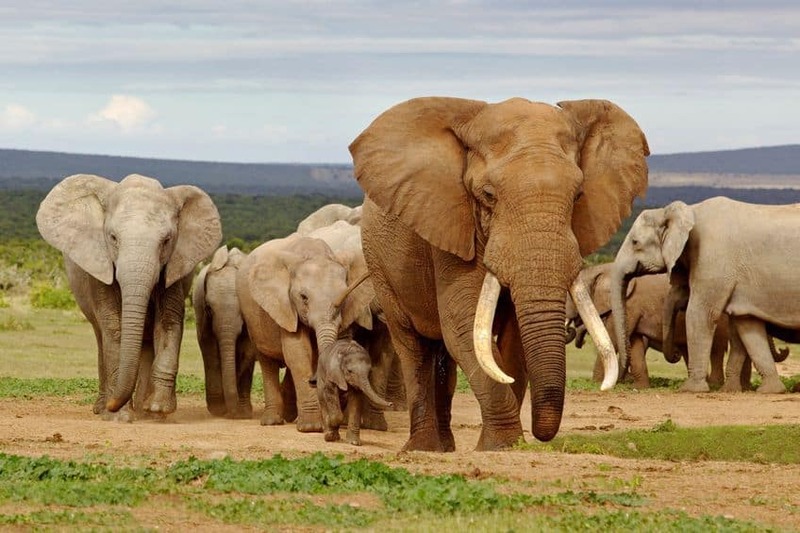 This week: how bees can help African farmers protect their crops from elephants, my upcoming seminars at The Northwest Flower and Garden Show, and why I’m old school when it comes to free speech and open debate. 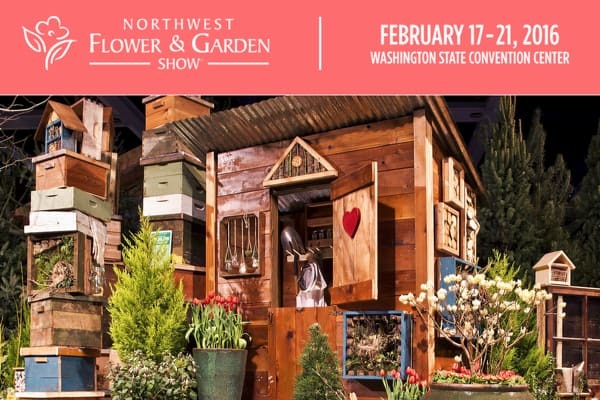 The horticultural big deal Northwest Flower and Garden Show is coming up next weekend. As in years past, you’ll find me in the seminar rooms, demonstrating gardening and productive home techniques. We think of food preservation as a summer activity – but many of our best cool season NW vegetable crops are ideal for preservation through lacto-fermentation. Learn about this health-boosting traditional method of converting hardy vegetables into long-lasting and delicious pickles. I’ll demo Spiced Ginger Carrots, Sauerkraut with Apples and Caraway, and Korean-spiced daikon radish and salt-cured Meyer Lemons. If you want to save money, grow unusual vegetable varieties, or have the earliest possible harvest, starting your own seeds indoors is a must. I’ll discuss the most important and often confusing aspects of starting your own seeds indoors so you can grow your own vegetable starts with confidence. Specific planting, up-potting and thinning techniques and timing secrets will be demonstrated. In addition to the post-seminar signings, I’ll be at the University Book Store Booth to sign copies of my book and answer questions. The coolest thing I’ve read in the past few days isn’t a book, it’s an article from Mother Nature Network about how fences of beehives are helping African farmers keep elephants out of their vegetable fields. Elephants, despite their thick skin and imposing heft, are terrified of bees. And for good reason: When elephants disturb a beehive, they trigger its defensive swarming response, which often leads to bees stinging the sensitive tissue inside their trunks. Being such intelligent animals, elephants have learned to associate bees with excruciating nose pain. They even have a specific “bees!” alarm call, and they’re known to flee the sound of buzzing alone. Couldn’t farmers just repel elephants with audio recordings of bees? Maybe briefly, but elephants are too clever to buy a ruse like that for long. Like other noise-based scare tactics, it stops working once elephants realize the sound is an empty threat. As scientists have shown in recent years, however, a fence made of actual bees can be an effective, even profitable way to keep elephants at bay. It’s a brilliantly simple strategy, hanging beehives from wooden posts at 10-meter intervals with a long metal wire linking them all together. When an elephant hits the wire, it shakes the hives and sends angry honeybees swarming into a defensive frenzy. Very cool stuff. If you like this kind of thing, check out Elephants and Bees for more info on how you can help keep the project going. There are moments when I feel like I’m still a young adult. And then I meet a legitimate young adult and I realize I’m as old and tired as re-used dirt. It turns out there’s a legitimate term for this. It’s called the Dunning–Kruger effect. Their research also suggests corollaries: highly skilled individuals may underestimate their relative competence and may erroneously assume that tasks which are easy for them are also easy for others. TL;DR: incompetent people don’t know they are incompetent. Explains a whole lot about politics, doesn’t it? It seems to me that one of the best ways to figure out what you really understand is through rigorous and unfettered discussion about the merits of various ideas. Eventually, if you stand up and defend your ideas long enough you’ll run into someone who has forgotten more on the topic than you’ll ever know. It’s then that you recognize how little you know, and that is where the fun really starts. It’s easy to fall into a defensive posture when confronted with an opposing perspective. It’s easy to think your own viewpoint is inherently legitimate because you feel it to be legitimate. It’s easy to see a challenge to an idea as a personal attack. Sometimes I fall into this trap, too. “But I was just expressing my opinion!” I’ve thought when hurt by a friend or reader who’s disagreed with one of my rants. Well, that’s all well and good, but in the public sphere my opinion is only as good as my defense of it. My feelings about my opinion are, frankly, irrelevant. 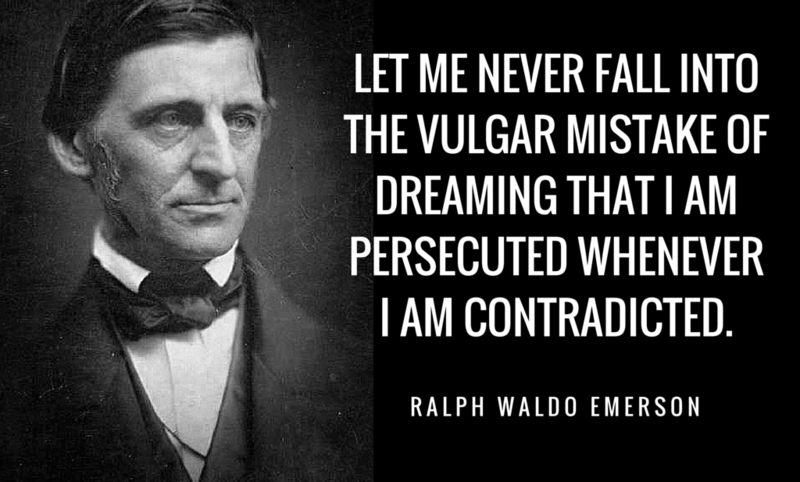 As Emerson advised, I try not to mistake contradiction for persecution. I think it’s very important societally that we not just tolerate but encourage discussion and dissent, no matter how challenging the topic. This is how we separate the good ideas from the bad. This is how we see what notions still float when the waters get choppy. What have you guys been thinking about, reading, eating or doing lately? Help me round this week out with your own great points-to-ponder in the comments. 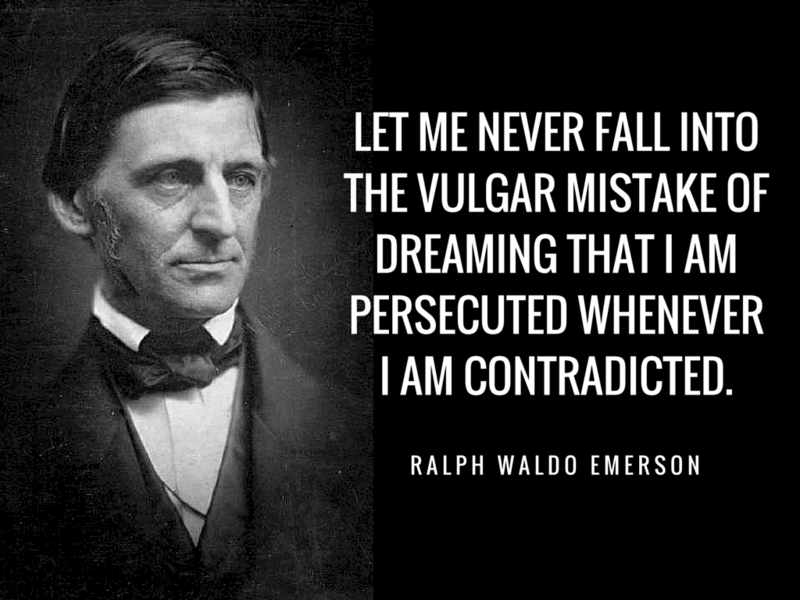 I love the Emerson quote, Erica, thanks for reminding me of it. My first packet of seeds of the season arrived yesterday, and tomorrow I’ll be startin’ them up! Sorry you’re feeling ill, and I hope you feel mo’ bedda soonest. I’ve been watching a lot of farming related stuff. I watched all of Jack Spirko’s Duck Chronicles, a lot of the BBC Historical Farm series, and now All Creatures Great and Small. Ordered my seeds for the year. Tomorrow, if I don’t get lost, heading out to check out a homesteading club someone invited me to that’s a hike from my house but I want to try meeting some like-minded local folks. Hope your health gets better very quickly! I was visiting my undergraduate campus today for the first time today and was overwhelmed with nostalgia. I was surrounded by *fervent* discussions and all I could think was “oh, this is so much harder than you realize.” I am not belittling their discussions; I was the kid having those same discussions. It just IS so much harder than they realize yet. Once you have to pay your way through the world AND keep those ideas alive, things get harder. I have all my seeds to start and all the materials, just need a window of time to enjoy the process. I was a little early last year, so I’m thinking sometime this week will be just right. I’m so right there with you, Kyle! I went back to my undergrad school once to give a talk to a class about what I do now. It was eye opening and so frustrating…I had to bite my tongue so that I didn’t yell at them to wake up and pull their heads out of their assets. It really IS clear when you’re 19 and 20 and can only see how everyone else is screwing up. A few life-smackdowns later, and at least some of us get a little more humble. Hope you feel better soon. Our garden expo is this weekend and it is -6°F rich now. I just want to stay home! As always, Erica (and Homebrew), you give me food for thought. Like Dale Carnegie said, “It isn’t what you have, or who you are with, or where you are, or what you are doing that makes you happy or unhappy. It’s what you think about.” . . . That and drinking my morning coffee while examining my starts for every new leaf! Thanks for giving me new ideas to ponder and techniques to learn! hope you feel better! and good luck with your demos – yay! i saw a blurb about free speech that really hit the nail on the head. they were saying that we need free speech so we know how others – especially extremists – are thinking/feeling/planning. and by shutting down hate speech or hard opinions – we are really shooting ourselves in the foot. that the ‘cost’ of no-hurt-feelings was not knowing how far other’s opinions are and not being able to prepare to deal with them. it was an interesting argument. i am against all of the political correctness. i’d rather have my feelings hurt then not know what someone really thinks. love the live bee fence. I too have learned how little I know… what a surprise for this know-it-all!….and find it pretty relaxing and refreshing 🙂 It has moved me to insert ‘I think’ before and after most of what I say. At 75 I think I have learned everything there is to know….but….here is sooooo much more. that bee-elephant article is SO COOL!! thanks for sharing and feel better! I’m hoping to be at the flower and garden show on Saturday! Unfortunately I’ll probably miss your seminar because I’m probably just doing the half-day deal and letting my two year old nap at home before we go. I hope to run into you though!